Hello and welcome! 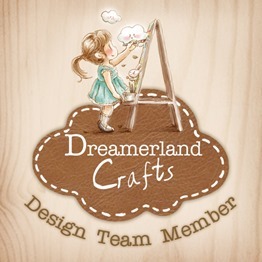 Some of you may be new to my blog since Dreamerland Crafts is introducing the 2019 design team and today is my day! This is a fun and fairly easy card to make. I will do a little paper piecing (just a little) to give it a more interesting look (it's the lazy way to color a dress!). 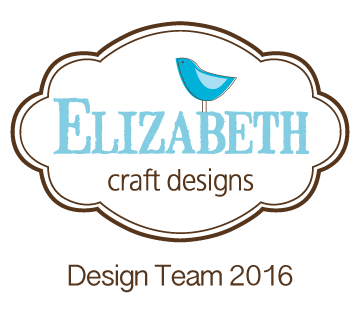 Please help support my blog by using the links if you are planning to buy some crafty goods - it doesn't cost you anything but helps me in a small way. 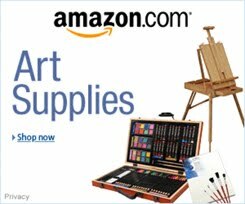 I actually buy most of my supplies... way outspending what I get from companies and from my small earnings, much to my husband's consternation. You do not have to buy the item you click on either - anything you purchase from the linked store after clicking will help, just keep in mind that the cookie (used to track where you came from) will expire not long after clicking so if you would like to support this blog, click just before making a purchase. Know that I really appreciate it! If you like my work, you may want to subscribe via email (Feedburner) or Bloglovin' - you may find the links to both on the right side, below all the badges (there's also a Bloglovin' link at the end of this post). 1. If your Dreamerland Crafts Photographer stamp is new, I recommend conditioning it with a little VersaMark ink before using; just tap some on and wipe with a finger such that some of the stick stays on it. From the Doodlebug Hello Sunshine pad, find the brown pattern sheets shown, using the small print for the dress. Mount stamp on Stamp Platform - you may alternatively use an acrylic block but the Stamp Platform not only allows you to more precisely position the stamp but also re-stamp if it doesn't go well the first time. Use Tuxedo Black Memento Dew Drop ink pad to tap ink only in the dress area of the stamp (if using the full pad, you may want to mask off the other parts when inking then remove before stamping) and stamp in a corner of the patterned paper. Optional: I recommend cleaning stamps with the Lawn Fawn Stamp Shammy. It cleans really well, does not leave lint behind, and is better for the environment than using baby wipes. I do not put it in a container to keep it wet from session to session - it will grow bacteria. Better to let it dry naturally then rewet the next time you use it. Note: it used to annoy me that it was so hard when dry but I got used to it. It only take a few seconds of wetting and wringing to get it pliable. 2. 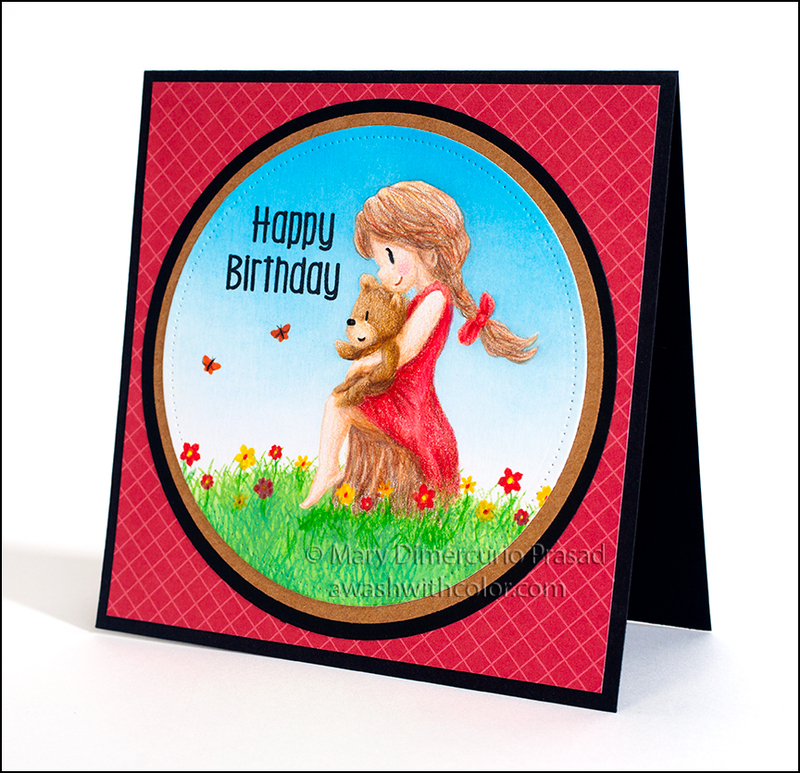 Ink the stamp again across the entire design and stamp on a piece of X-Press It Blending Card. 3. Color image with Copic markers (or other alcohol markers). You may color the dress area with dark gray or black (in case the fussy cut dress wasn't perfect - this will hide minor issues), or just leave it white (if the fussy cut dress fits perfectly). Optional: add some shadows to the dress, e.g. in the skirt creases. The colors I used are listed under Supplies. 4. Use a pair of detail scissors to fussy cut around patterned dress, hummingbird, and photographer. To get into the small areas, use a craft knife and self-healing cutting mat. From the back side, go around the outside edges with the brush end of a Tuxedo Black Memento Dual marker. This gives it a finished look by hiding any white edges. Adhere dress to photographer. 5. Cut a piece of dark pink cardstock 5 1/2 x 8 1/2 inches; fold in half to form a 4 1/4 x 5 1/2 inch card base. Cut black cardstock 4 x 5 1/4 inches. Adhere to card base using Xyron Tape Runner or other permanent adhesive. 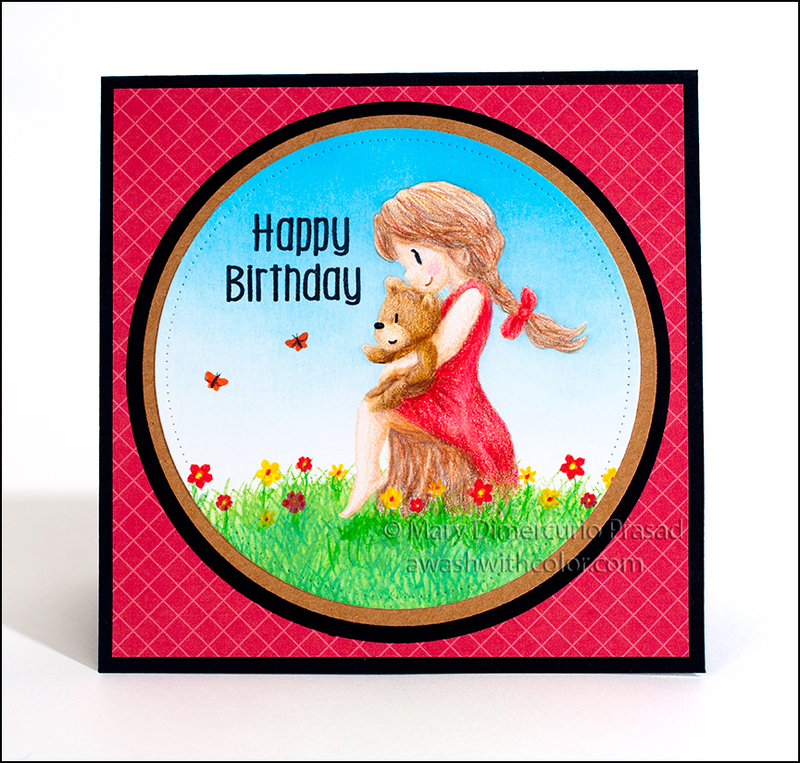 From Doodlebug Hello Sunshine pad, find the brown background paper shown on card front; trim to 4 1/8 x 5 3/8 inches. Adhere to card base. 6. From light blue cardstock, die cut two clouds (Outdoor Scene). From light pink cardstock, die cut cross-stitched square. Adhere to card base where shown. Adhere small cloud where shown. Use dimensional tape to adhere hummingbird and photographer as shown. 7. Put a piece of dark pink cardstock in Stamp Platform; brush with powder tool to prevent extraneous embossing powder from sticking where you don't want it. Stamp Celebrate Today (Dreamerland Crafts Birthday 11 stamp set) in VersaMark ink. Heat emboss with Pink Peony. Trim as shown. Cut black cardstock just a tiny bit larger; I just eyeball it: with the trimmed sentiment in a corner of the black cardstock leaving the amount I want around the two edges, and mark the other two edges with a pencil then cut. Adhere sentiment to black. 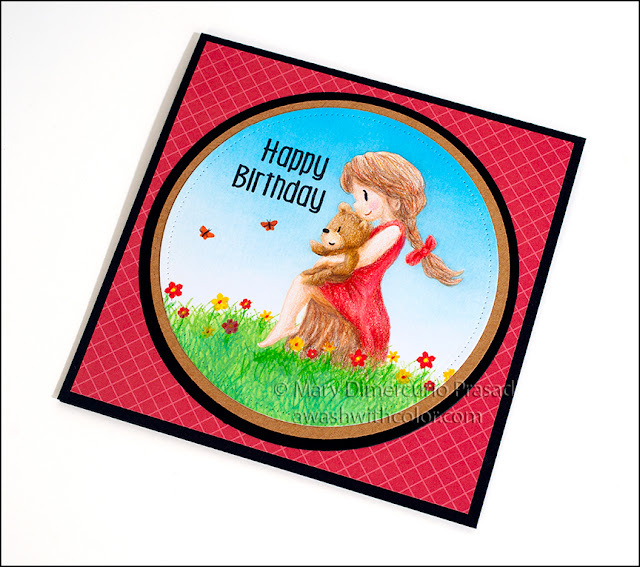 Adhere to card using dimensional tape. Follow my blog with Bloglovin so you won't miss any of the paper piecing fun! 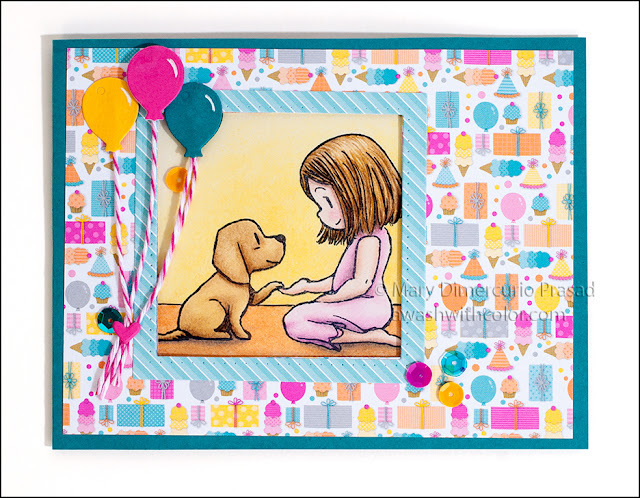 I used this sweet Dreamerland Crafts stamp "Love My Puppy" as the foundation for my Spinner Square Pop-up birthday card. I wanted to have the image peeking through a front window in the card, then when opened, have the sentiment move down as the image pops up. 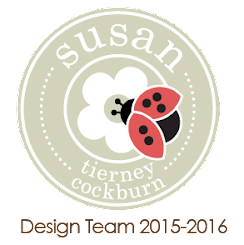 The fun Doodlebug Design papers I used - Sugar Shoppe - are older (from 2014) although you can still find some around. 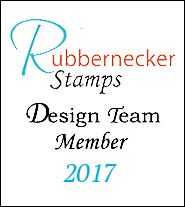 Of course you can substitute some of the newer Doodlebug Design papers, just adjust the colors to match. Once again I'm testing Lavender Spike Oil as my blending solvent. It has a very strong smell of lavender so if you don't like lavender, I don't recommend it. The fumes are not toxic (unlike other popular solvents). This time I'm using it with oil based pencils - Faber-Castell Polychromos. I must say, they blended beautifully. 1. Use Stamp Platform to stamp Love My Puppy (Dreamerland Crafts) on Strathmore 500 Bristol Plate in Memento Tuxedo Black ink. Use Black Copic Multiliner SP .3 to draw a ground line across image background. 2. Color image using Faber-Castell Polychromos colored pencils, blending with Lavender Spike Oil and blending stumps. Note: I use a Kum Long Point Sharpener to sharpen my pencils - it gives you a very fine point in two steps. Once the image has been colored, use the largest square from Spinner Square Pop-up to die cut image. This will be your pop-up platform (step 3). 3. Before assembling the card, watch the video below - specific notes follow. I recommend watching the video then looking at the notes, and finally assembling the card while watching the video a second time. 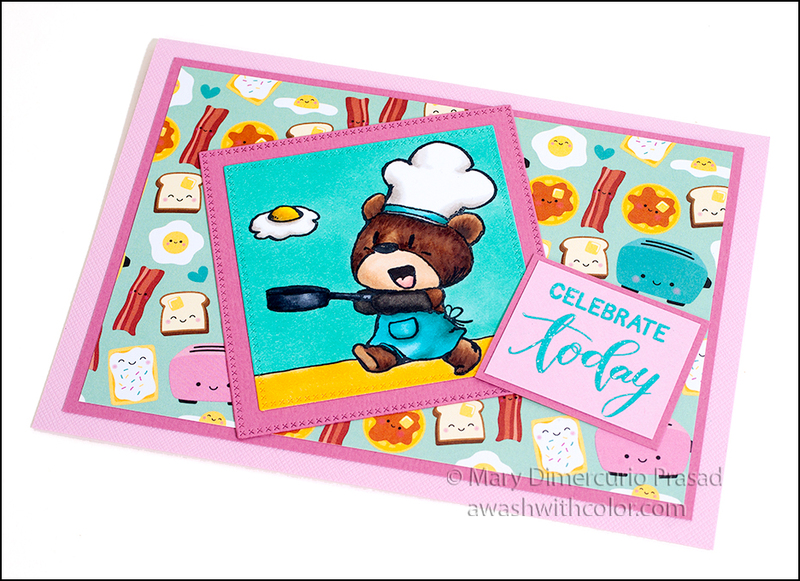 Cut teal cardstock for the base card as shown in the video, 4 1/4 x 11 inches. Die cut teal for the arm - mark with Xs where shown. Cut the inside papers - see photos for the patterns I used; note: I used 4 x 5 5/16 inches instead of 4 x 5 1/4 inches to put the inside edges a little closer to the fold. Remember to only tack down the left side of the window sheet (inside left) as shown in the video. I used recycled plastic packaging for the window. For the front of the card, I cut the paper to 4 x 5 1/4 inches. You could adhere it to the front temporarily and try to cut through 3 layers but it probably won't cut all the way through. I recommend cutting two layers as in the video, removing the resulting cut squares (keep them), adhering the front patterned paper, then fitting the die into the hole to cut the front. Cut frame, from diagonal teal striped side of paper, as shown in video. Keep squares that fall out of windows. I used the teal one for the rectangle that moves inside. For adhesive, Lineco in a fine tip bottle (shown in video) works very well; it creates a strong bond, and dries quickly. 4. For the sentiment, use the leftover inside square from the front of the card - the backside has light teal stripes. Use Stamp Platform to stamp "Happy Birthday" (Birthday 11) in VersaMark ink. Heat emboss with Gun Metal (note: I cut my stamp words apart; if you do not want to cut them, then you will have to mask them). Trim to fit on movable arm and adhere (I used removable tape to test before gluing down to make sure it wouldn't stick out of card when closed). 5. Using balloon from Birthday Charms, cut three from teal cardstock, one from yellow cardstock, and one from dark pink cardstock. Be sure to keep all holes! You will glue them back in and flatten with a Teflon bone folder (which flattens but won't make the paper shiny). Use white Gelly Roll to draw shine on balloon (you may use the stencil provided with the die). Note where each balloon goes on the card (the teal ones should all line up), cut twine for strings, adhere top of twine where it will be behind each balloon (if it helps mark with pencil first). Adhere balloons where shown, using dimensional tape to pop up dark pink balloon on front of card. Die cut small heart (Birthday Charms) from dark pink cardstock; adhere where shown, gluing front balloon strings together. Adhere sequins where shown (note: be sure sequins do not interfere with arm movement). Follow my blog with Bloglovin so you won't miss any of the sweet puppy fun! I just couldn't resist this adorable bear chef (by Dreamerland Crafts) making breakfast! I decided to color him with Copic markers and pair him with Doodlebug Design paper that's covered with cute breakfast foods. 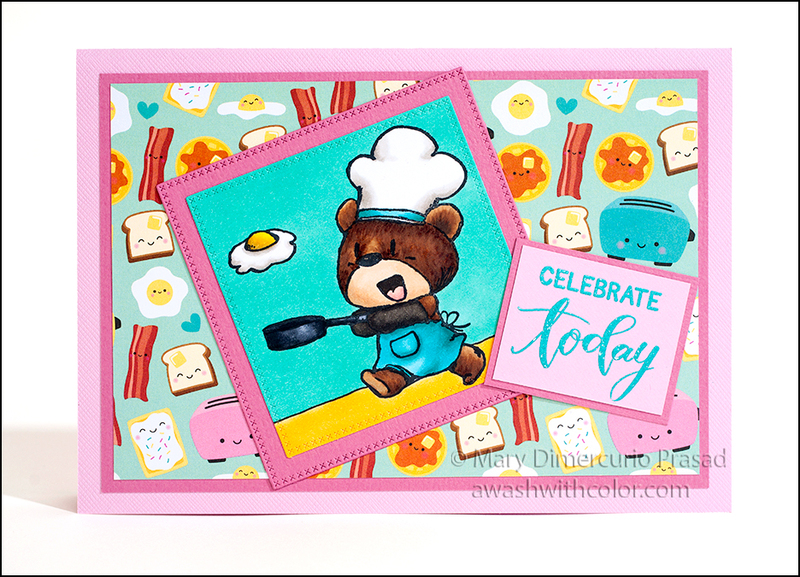 I tried to closely match the paper when choosing colors for the bear's clothes and background. 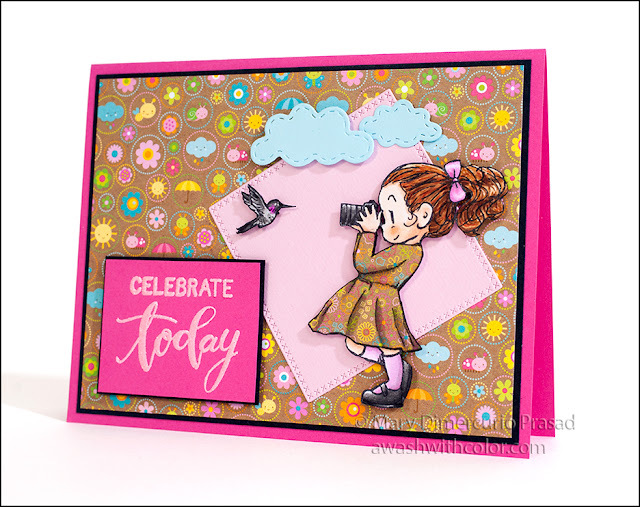 Wendy Vecchi's embossing powder perfectly matched the color theme so I used it for the sentiment. This is such a happy card - perfect to send to a friend who needs a little cheering up. 1. Cut pink cardstock 7x10 inches; fold in half to form a 5x7 inch card base. Cut dark pink cardstock 4 1/2 x 6 1/2 inches. Cut Waffley Cute paper to 4 1/4 x 6 1/4 inches. Adhere to dark pink then adhere to card base. 2. 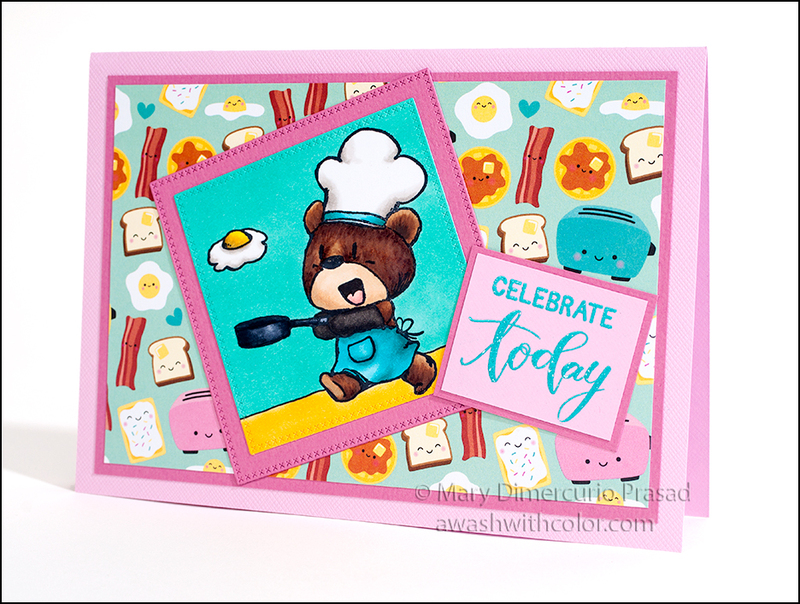 Use Stamp Platform to stamp Breakfast Chef (Dreamerland Crafts) on Neenah Solar White cardstock in Memento Tuxedo Black ink. Use Black Copic Multiliner SP .3 to draw a ground line across image behind bear. Color image with Copic markers (the colors I used are listed below in Supplies). 3. Use largest CottageCutz Cross-Stitched Square to die cut dark pink paper. Use second largest to die cut image. Adhere image to dark pink square. Adhere to card as shown. 4. 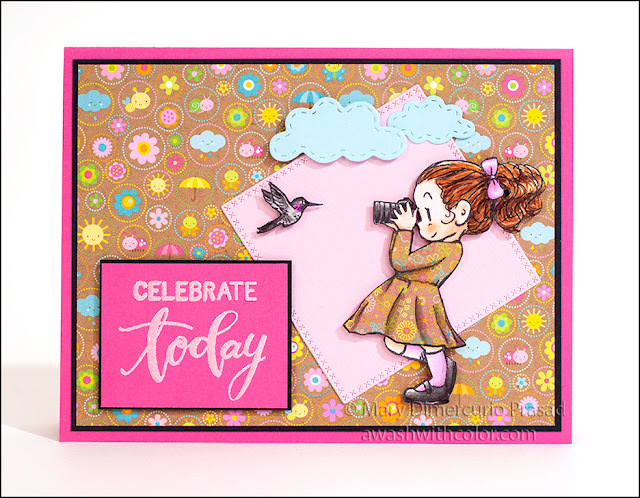 Using a Stamp Platform, stamp "Celebrate Today" (Birthday 11) on pink cardstock using VersaMark ink. Heat emboss with Garden Patina. Trim down if necessary. To create a mat, cut dark pink cardstock 1/8 inch larger (so there will be 1/16 showing all around). 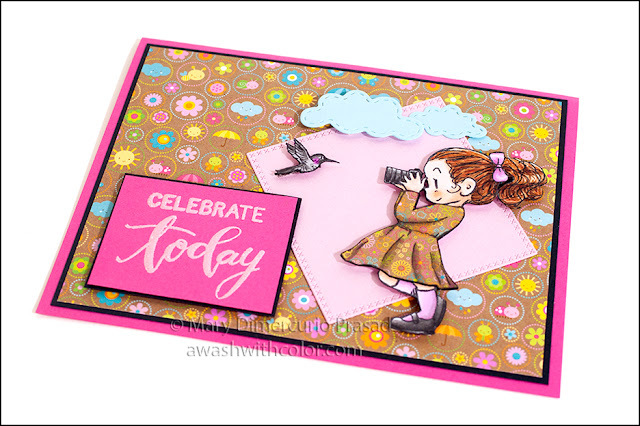 Adhere sentiment to dark pink mat. Adhere where shown. Follow my blog with Bloglovin so you won't miss any of the breakfast cuteness fun!